Anemone hupehensis, Anemone hupehensis var. japonica, and Anemone × hybrida (commonly known as the Chinese anemone or Japanese anemone, thimbleweed, or windflower) are species of flowering herbaceous perennials in the Ranunculaceae family. The species name hupehensis is derived from Hubei, the name of the Chinese province with Wuhan as its capital. Anemone … is a genus of about 120 species of flowering plants in the family Ranunculaceae, native to the temperate zones. It is closely related to Pulsatilla (‘Pasque flower’) and Hepatica; some botanists include both of these genera within Anemone. Name: According to the Oxford English Dictionary, Greek anemōnē means “daughter of the wind”, from ánemos “wind” + feminine patronymic suffix -ōnē. The Metamorphoses of Ovid tells that the plant was created by the goddess Venus when she sprinkled nectar on the blood of her dead lover Adonis. The name “windflower” is used for the whole genus as well as the wood anemone A. nemorosa. 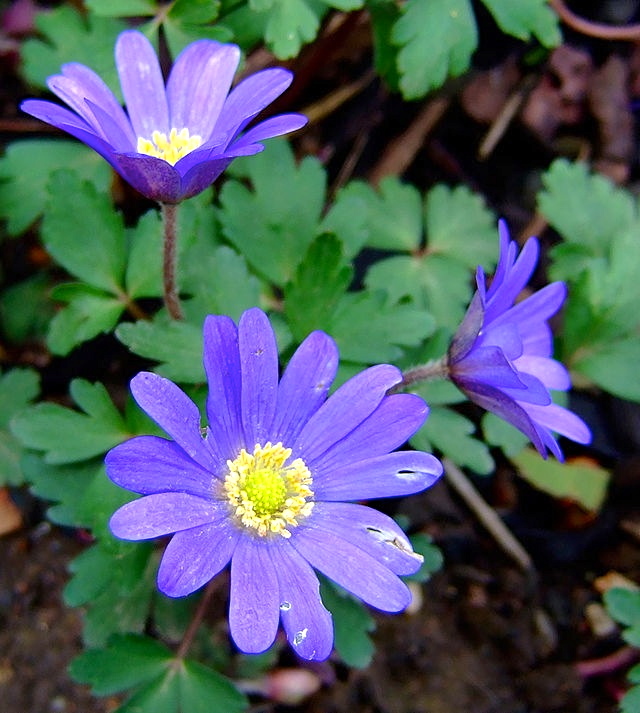 Of the late spring [anemone] bulbs, A. blanda is one of the most common, and is often sold as a mixture of colours, although purple predominates. 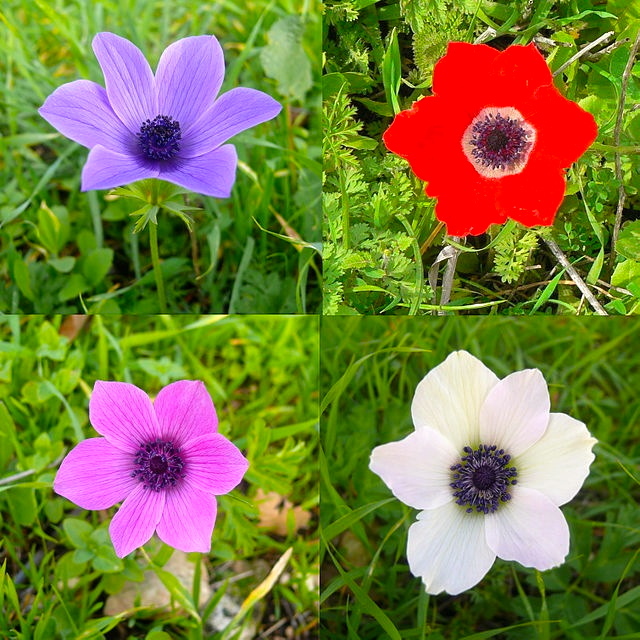 Among the best known summer anemones is A. coronaria, often called the poppy anemone, a tuberous-rooted plant, with parsleylike divided leaves, and large showy poppylike blossoms on stalks of from 15–20 cm high; the flowers are of various colours, but the principal are scarlet, crimson, blue, purple, and white. There are also double-flowered varieties, in which the stamens in the centre are replaced by a tuft of narrow petals. It is an old garden favourite, and of the double forms there are named varieties. Anemone hupehensis, and its white cultivar ‘Honorine Joubert’, the latter especially, are amongst the finest of autumn-flowering hardy perennials; they grow well in light soil, and reach 60–100 cm in height, blooming continually for several weeks. Anemone coronaria (poppy anemone, Spanish marigold …) is a species of flowering plant in the genus Anemone, native to the Mediterranean region. This entry was posted on August 30, 2014 at 5:20 am and is filed under Language and plants. You can follow any responses to this entry through the RSS 2.0 feed. You can leave a response, or trackback from your own site.